Growing up at Abiding Presence, I would never have dreamed that I would one day become the Children and Family Minister. Now that I have been in this call a few years, I cannot imagine doing anything else! My husband and I met singing in the Abiding Presence children's choir many years ago and are delighted to now be raising our four kids at Abiding Presence surrounded by our extended family. I'm passionate about helping families find ways to incorporate faith at home. I love watching the children of Abiding Presence "get it" when God becomes real to them. I am a trained teacher with a degree from George Mason University in Physical Education. It never ceases to amaze me just how many of the same principles apply to teaching children about God as do teaching them about physical fitness. 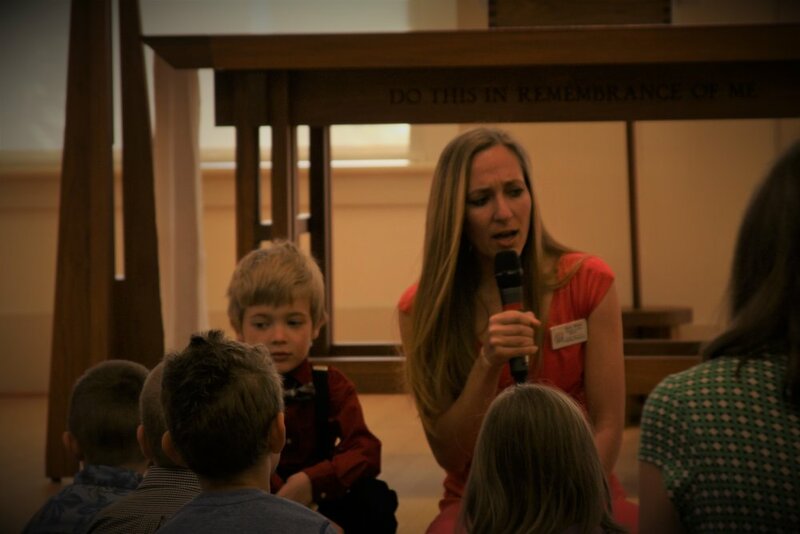 When I am not at the church or running around as the mom of four preschool and elementary school age kids, I enjoy playing the harp, following Washington sports team and spending time with my extended family who all live in the area. I have the great privilege of working with the musicians and all sorts of creative people and supporting volunteers at Abiding Presence, overseeing all aspects of music and technology ministry, as well as contributing to worship planning, communications, and volunteer scheduling. From playing organ and piano, to directing the adult/youth/bell choirs and praise bands, to writing arrangements for our orchestra and brass, to setting up lighting and sound with our wonderful tech volunteers, to designing new graphics or video edits, you might find me at any place in the church any hour of the week! What I love most is enabling and encouraging people to use their gifts to worship and glorify God and serve each other. My job is to help you get connected and involved in our music and arts ministries in whatever way you are called! Prior to coming to Abiding Presence in 2014, I served as the Minister of Music and Worship Arts at Front Royal United Methodist Church, and prior to that in professional and volunteers capacities at a variety of different faith communities. I completed a B.M. in music composition and M.M. in Music theory-composition from Penn State, and I'm working on my dissertation for a D.M.A. in composition from George Mason. Outside of Abiding Presence, I teach some college music theory classes, I play piano and compose for various groups (including Opera on Tap DC Metro), and I love to visit new coffee shops and breweries. If you play an instrument, love to sing or are just willing to serve, please send me an email or come find me and I'll get you connected!